What are dental crowns and caps? Dental crowns or caps are used to return the function and esthetic appearance to teeth that are structurally compromised and are also used on dental implants. 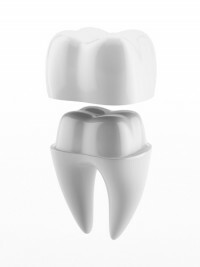 Non-metal ceramic crowns are made from different types of ceramic and can be used in different ways. The best material is selected for the case in hand, to create a balance between appearance and longevity. What types of dental caps and crowns are there? Dental crowns and caps use a fixed prosthesis that is cemented to the natural tooth after it has been prepared for the procedure. Dentists can use dental crowns to improve the appearance of our teeth, as well as protect them, especially for teeth that have been weakened, for instance teeth that have undergone endodontic treatment (root canal). The team at Estudi Dental Barcelona specialises in dental crowns and caps and esthetic dentistry, with a large number of satisfied customers. We offer each patient a personal consultation to make sure they are fully satisfied before and after esthetic treatment. Trust the professionals, do not leave your health and your smile to chance. Metal crowns or caps are very hard-wearing and last longer. The only problem is that they are not attractive. Metal and porcelain dental crowns and caps: The inside is metal, while the outside is made from porcelain, which gives a more natural look and means the tooth looks similar to neighbouring teeth. Porcelain crowns or caps: These types of crowns are most commonly used at the front of the mouth between the canines because of their esthetic appearance. However, they are less hard-wearing than metal-porcelain crowns and so should be used with caution. More information about porcelain (or ceramic) caps. Zirconia crowns or caps: zirconia dental crowns are the most attractive and hard-wearing and this is why they are usually recommended by dentists. All-porcelain crowns are the most attractive form of prosthetic reconstruction and are used to replace teeth that have lost a large amount of dental structure in areas of the mouth that affect the look of the smile. All-porcelain crowns are often known as porcelain caps or ceramic caps. This type of esthetic prosthesis is hard wearing enough to protect the tooth being reconstructed, while giving very attractive, natural results. Dental crowns are a treatment that is usually used mainly in premolars and molars, although they are also sometimes used on the teeth in the anterior area of the mouth. On the other hand, dental veneers are only made on the teeth in the front of the mouth. Learn more about dental veneers. With the use of dental crowns we strengthen the teeth, especially in those that are weaker or are devitalized with crowns the tooth will be more protected and stronger. They are also useful when making a fixed bridge and so we can replace missing parts without the need for implants or use a removable partial denture. On the other hand, with the dental veneers we will only try to improve the aesthetics of our teeth, both by changing the shape and the color, the patient can choose the desired color and thus improve the aesthetics of their teeth. How does the dentist prepare the tooth for the crown? The tooth to be treated must be carved before making the tooth cover. The process of dental carving consists of reducing the size of the tooth so that we can then place the tooth cover over it. What's the difference between a crown and an inlay? The inlays are indicated in regions where dental aesthetics are necessary, patients with low rates of dental caries, patients with good oral hygiene, wide cavities, supragingival margins, endodontic teeth, restorations and abutments of dental prostheses. Dental crowns are recommended when teeth are affected by tooth decay or are fractured and will remain weak only with reconstruction, in devitalised teeth, i.e. with a previously performed root canal, as these are weaker and have a greater risk of fracture.